Hamilton May would like to present a 2-bedroom apartment located on the 3rd floor of a building in the heart of the Kazimierz district. Hamilton May is pleased to present a one bedroom apartment with a balcony and a beautiful view of the Vistula River in a new exclusive building by the Vistula Boulevards. Hamilton May presents a large 2 bedroom, 2 bathroom apartment located on the top floor of a newly built Tarasy Twardowskiego complex in the Ludwinów area of Kraków. Hamilton May presents for rent fully furnished two-bed apartment with separate kitchen in perfect location. Hamilton May presents a brand new, bright one bedroom apartment located on the 3rd floor of the newly finished Concept House development in Zabłocie. Hamilton May is pleased to offer this elegant two bedroom apartment right next to the Wawel Castle and the Vistula River. Buma Square is an office complex from 2006 which comes with a developed commercial infrastructure. It was developed by Buma Contractor from Kraków, based on the project by DDJM Architectural Office - also based in Kraków. The development offers access to many services including: bank, post office, local and foreign press, lunch bar, mobile phone service providers, as well as many other specialized services and a taxi stop. The modern office building offers 28 000 m2 of usable floorspace along with 545 parking spots. Buma Square is situated by Wadowicka street, in a dynamically developing neighborhood. It grants very convenient access to the city center, which can be reached in 12min. Additionally, the vicinity of the Matecznego Roundabout makes it possible to take advantage of a developed network of public transportation. One of the largest shopping centers in the entire city - Bonarka City Center is also situated nearby. 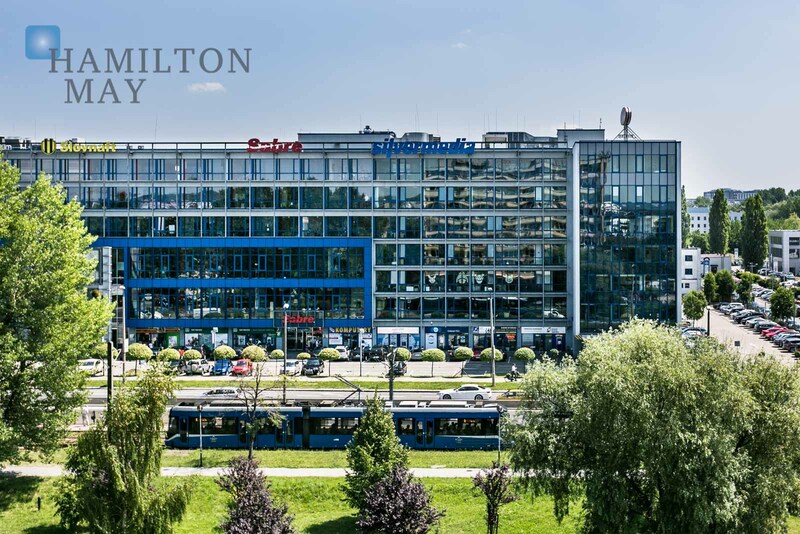 Hamilton May regularly receives inquiries from various individuals and entire families moving to Kraków, searching for apartments available for rent in the vicinity of the Buma Square. Our Agency provides a wide choice of meticulously selected properties, which meet the typical criteria; floorspace of at least 80m2 and property's layout featuring two or more rooms. Such properties usually come with a garage or a parking spot, that are so sought after by a vast majority of tenants.